You can use Adobe Acrobat X Pro to reduce a PDF file size. Step 1:You must have the document saved as a PDF file. Note: Do not double click on the PDF file before starting the Adobe program. It will probably open in Adobe Reader, which doesn't have the ability to reduce file size. Step 2:Start Adobe Acrobat X Pro. Step 5:Click the drop down list arrow next to Retain existing. Step 6:Choose a lower version of Acrobat to ensure that it will be accessible to any recipients. 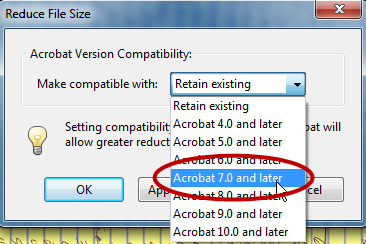 This example uses Acrobat 7.0 and later. Click OK. Step 7:Type a file name. You may want to change the file name slightly so that the original is not replaced. 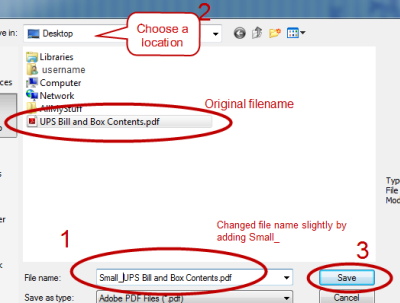 Choose a location for the file, then click Save. 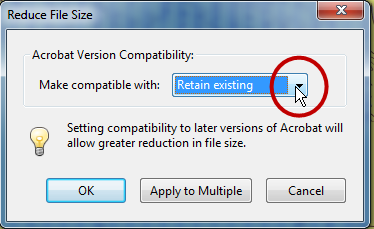 Step 8:After saving, the file will be significantly smaller.